Not only can you back up your virtual machines (VMs), but you can also perform image-based replication either on site for high Availability or off site for disaster recovery (DR). With Veeam’s 2-in-1: backup and replication for VMware vSphere, if a VM goes down, you can immediately fail over to a standby VM. Backup from Storage Snapshots gives you the ability to back up VMware VMs from EMCNEW, HPE, and NetApp storage snapshots up to 50x faster. Veeam allows you to create image-based backups and replicas from storage snapshots as often as necessary, even during business hours, with little to no impact to your production environment. Veeam Cloud Connect helps users avoid the risk of catastrophic data loss through hosted backup repositories. It’s the easy, efficient way to get backups off site. You can send off-site backups through an SSL connection to a service provider and maintain complete visibility and control. Easily access and recover hosted data directly from your backup console. You can also leverage Built-in WAN Acceleration, Backup Copy jobs and forever incremental backups. Veeam offers additional high-performance backup features for any deduplication appliance. Customers can get up to 10x faster backup performance with the new per-VM backup file chains option, which enables multiple write streams by leveraging parallel VM processing. Users can also improve local backup copy performance and reduce the load on deduplication appliances by eliminating data rehydration with new support for active full backups with backup copy jobs. With compression and deduplication included at no extra charge, you can manage the large volumes of data generated by image-based backups. You will reduce backup storage consumption and the amount of data sent over the network. Combined with bandwidth throttling and scheduling capabilities, Veeam extends the protection of your VMware vSphere environment to an offsite location or into the cloud. Increase the reliability of your Availability solution by copying backups off site to remote storage. With built-in WAN Acceleration, you can get backups off site 50x faster by utilizing caching, variable block length data fingerprinting and TCP/IP protocol optimizations. Support for HPE StoreOnce CatalystNEW for HPE StoreOnce Backup deduplication systems, provides superior source-side data deduplication to enhance backup performance, reduce backup costs and simplify backup environments. EMC Data Domain Boost provides source-side data deduplication and data in-flight encryptionNEW over the WAN, yielding faster and more efficient backups that enable lower RPO. Veeam delivers powerful features designed for enterprises with large scale deployments. Veeam Backup & Replication is available as a standalone consoleNEW that users can install on their workstations, providing added convenience, ease-of-use and the ability to eliminate RDP sessions to a backup server. Remote Office/Branch Office (ROBO) enhancementsNEW also help growing enterprises improve backup and recovery times, while reducing WAN bandwidth consumption, by keeping backup and restore activities local to remote sites. Direct NFS AccessNEW allows you to transport VM data directly from file-based (NFS) storage using Veeam’s proprietary NFS client, providing faster backups and with no impact on the virtual environment. Secure your VMware backups at the source, in-flight and at rest without negative impact on WAN Acceleration and compression using end-to-end AES 256-bit encryption. Even if you lose a password, you can still recover data from encrypted backups without compromising security. And it’s flexible — you can choose when and where to leverage encryption. With Native Tape Support you can archive individual files or entire VM backups to tape and restore data from tape when needed. Advanced features include parallel processing between multiple tape drives to improve archiving performance, a global media pool to provide highly concurrent tape archiving and automatic failover from non-operation libraries, and native Grandfather-Father-Son (GFS) retention to increase retention and save on tape consumption, plus more! Monitor jobs across multiple backup servers, edit jobs on any server and search across all backups — all from a centralized location using a web-based console. There are no agents for you to license, deploy, manage or monitor on ESXi hosts or VMs. Veeam provides monitoring and reporting tools to alert you of issues in your IT environment before they have a significant impact on operations. Veeam helps you monitor the health of both your backup and virtual infrastructures, including VMware vSphere and Microsoft Hyper-V environments, as well as troubleshoot performance. 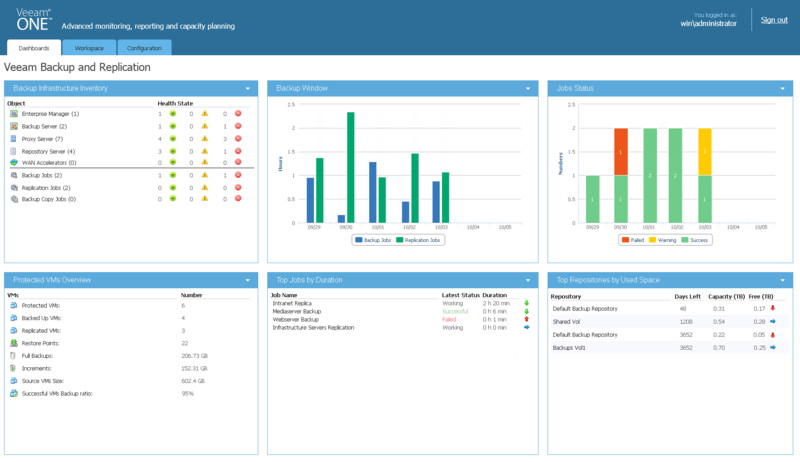 Report on VMs that are not backed up, control state of proxies and repositories, track free space consumption and analyze capacity trends to stay on top of potential storage space issues — all within your standard management framework. Veeam provides monitoring, reporting and capacity planning for your backups within your favorite management framework.